If you read my blog on any regular basis you know my love for vintage skills. But we can’t stop at learning and reviving these skills for ourselves. There are vintage skills kids need to learn! They need to learn them for themselves and for the continuation of these lovely life skills for the future. Not only that, these are basic homesteading skills as well. You might be like me, a suburbs kid that grew into a love of homesteading and self sufficiency. That’s ok, better to start late than not at all! I had the opportunity to learn many of these skills from my grandmothers but didn’t master them. My grandmother’s weren’t homesteaders but they came from a time when homemaking was done by hand. It is a lost art my friends. Maybe you’re asking yourself why we need to teach these vintage skills to kids. It isn’t just so the art of them are lost but our kids deserve to have the ability to care for themselves. We live in precarious times. Modern kids need vintage skills as a matter of survival, sustainability and self-sufficiency. 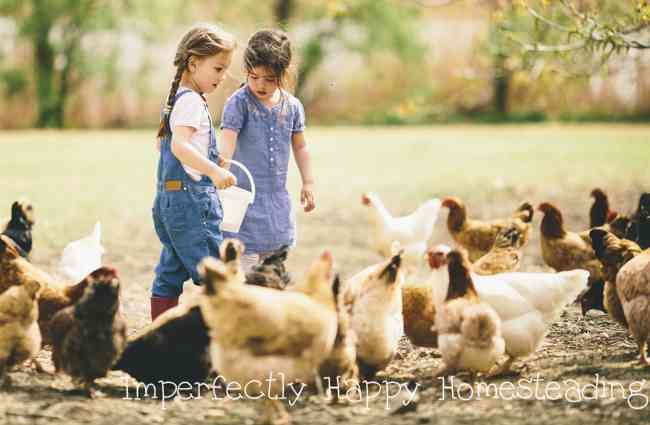 Here is my list of the vintage skills kids need for homesteading and beyond. They are in no particular order. Keep in mind the age, maturity and readiness of your child before diving into this list. But keep in mind, also, that in a bygone time kids were doing many of these chores before heading off to elementary school. You know your child best but they also may be more ready than we give them credit for. No boxes, no pre-cooked stuff. Just real, whole, food. Collecting some vintage cookbooks could help in this pursuit as well. Additionally teach them to plan meals, eat seasonally and how to follow directions in a cookbook. Tending and preparing animals for food. This may be as simple as tending laying hens and collecting eggs. Or it may be teaching them how butcher and process a chicken for the table. Don’t shy away from teaching where meat comes from. for growing one’s on food but it teaches patience vs instant gratification. It also shows them the importance of treating our planet with love and kindness. Furthermore, to paraphrase Ron Finley, kids that grow vegetables, eat vegetables. Now don’t forget to teach them about GMOs, heirloom seeds and seed saving. This knowledge is imperative to their future! Yes, even the girls! Go over how to change a tire, oil, how to jump a battery and any other basic repair you feel comfortable teaching. And show them the time frame for maintenance like oil changes, tune-ups, filter replacements. Knowledge is power – even if it just keep you from getting taken to the cleaners by a dishonest mechanic. How to make a budget, saving and paying cash. We live in a credit riddled society that constantly lives above its means. I am not pointing fingers, I too have done it and paid the price. There was a time when we saved for big purchases, put money away for a rainy day and never bought on credit. Can your kids split wood, start a fire, build a basic shelter? I learned these skills in girl scouts many moons ago and so thankful for them. But many kids are scouting anymore and still need to have a basic understanding of these skills! Even if you don’t want to hunt, at least take them fishing. Show them what bait works, how to put it on, how to reel in a fish and how to prepare it for the table. You could take this a step further and teach them wild foraging skills. You can’t be too prepared, right? Everyone, including kids, needs some basic knowledge of first aid. I am not talking how to put a band aid on! But how to make a sling. How to close a wound without stitches. What to do if someone goes into shock. CPR!!! I also think it is important to teach natural health care, herbal treatments and essential oils. My 9 year old will give you peppermint if you have a headache and lavender for bug bites and itches. She was taught from an early age about oils so it is her first thought, not pills. I’m not saying don’t teach kids about responsible western medicine but don’t stop there. Canning, dehydrating, even freezing. Kids need to be a part of preserving the harvest so they can preserve their own in the future. I don’t recommend little kids jump into pressure canning but they can help dry tomatoes or make their own fruit roll-ups. They can be in the kitchen when you sterilize your jars and pack them for canning. Gage their maturity and readiness for their own hands on lessons; but everyone can watch, listen and ask questions. *How to fold clothes, sheets, towels, etc. Taking it a step further! I hope this list gives you a jumping off point on vintage skills kids need. I’d love to hear how you’re teaching your kids skills or others you think should be added to the list. Leave me your thoughts in the comments. 10 Things Your Great Grandparents Did – And You Should Too! To be truthful its scary that people don’t know how to do these very basic things. I was blessed to have a family where everyone worked and did everything. Both my parents taught me to cook from scratch my dad taught home repairs, mom taught me auto care and gardening grandma taught me to sew and other crafts, and my aunt amd uncle taught me about the farm. Looking back it was a blessing growing up like this as it has led me to be able to achieve my dreams. Absolutely wonderful resource. I will print and use this to pass on to children, grandchildren and great grandchildren. Could you please suggest your favorite resources? It really depends on the skill you’re trying to learn. I love blogs and youtube but a live (in-person) mentor is usually best.